If you would like to attend but may be in need of a ride, please let the office know, and we will try to connect you with another member. Jennifer R. Pope, Partnership Specialist, from the Dallas Regional Census Center/Field Division/Denver Region of the U.S. Census Bureau, will discuss Operations and Timeline, Recruiting, and Outreach for the 2020 Census. Tracy Westen, J.D., a member of the National Governing Board of Common Cause and Adjunct Professor at UCLA Law School and USC Annenberg School for Communication, was in California during the enactment of the two ballot initiatives that created the California Independent Redistricting Commission and gave it jurisdiction over state legislative and congressional races. Stephanie Swanson, LWV TX Redistricting Issue Chair and a leader in Fair Maps Texas, will speak to the general impact of the census on redistricting and provide an overview of redistricting. She will also address litigation that conflates partisan with racial boundaries. Independent Texas Redistricting, and Common Cause. The LWV develops positions after members study an issue and reach agreement on certain points. LWVUS supports redistricting processes and enforceable standards that promote fair and effective representation at all levels of government with maximum opportunities for public participation. The League prefers that responsibility for redistricting be vested with an independent commission. The standards for a redistricting plan is that it be enforceable in court and have equal population in each district, have contiguous boundaries, and provide for effective representation of racial and linguistic minorities. The districts should also provide, to the extent possible, partisan fairness, preservation of communities of interest, and respect for the boundaries of municipalities and counties. The plan should not protect incumbents or offer preferential treatment of a political party. 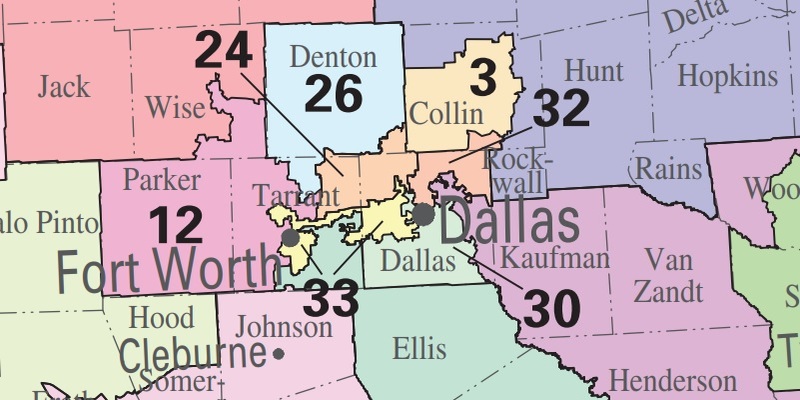 LWV-TX supports the formation of a redistricting commission to redraw boundaries according to certain criteria: total population, contiguous lines, compactness, boundaries that coincide with local political subdivisions, no dilution of minority voting strength, and without regard to incumbency or political party. Since redistricting is primarily a state responsibility, LWV-Dallas’ position, stated briefly, supports fairly apportioned districts and recognition of citizens’ right to vote.